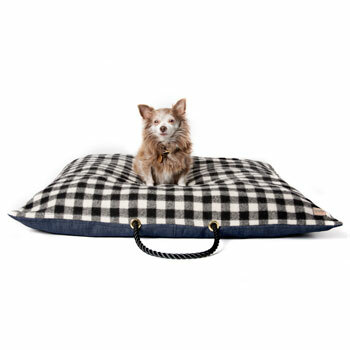 Handcrafted in Brooklyn, NY especially for adopted animals and their people, this custom-made dog bed is a perfect addition to any living room. Built to last and last. Nothing ages more beautifully than marine-grade rope, woolen fabric, denim, and solid brass. The cover: Constructed from black and white wool, solid brass grommets, solid brass + black zipper closure, and marine-grade rope. Top stitched with industrial thread for extra durability. The insert: Made from 100% recycled USA shredded pre-consumer foam rubber. The insert will not compress and is easy to fluff and shake out. Sizes: Medium 30"x30" Large 40"x40"